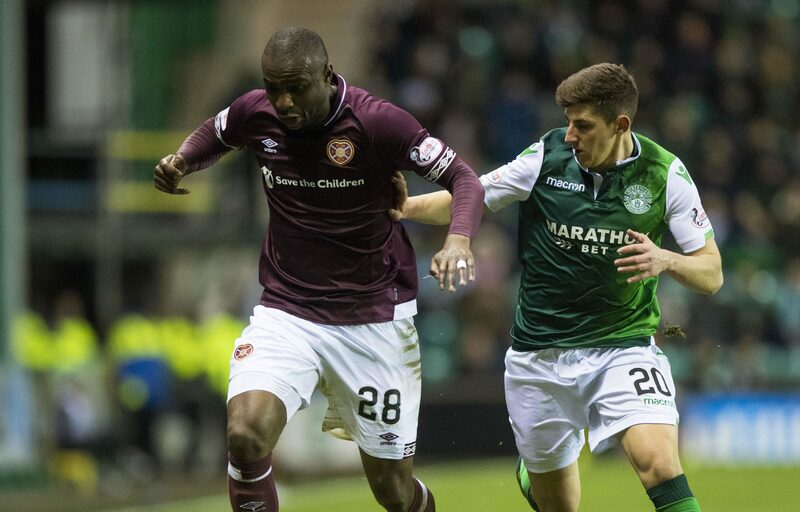 HIBS last night vowed to identify and take action against a fan who appeared to racially abuse a Hearts player. TV cameras caught the Hibs supporter aim what looked like a race-related insult at Jam Tarts star Clevid Dikamona during yesterday’s capital clash. A clip of the incident, taken from Sky Sports’ live broadcast of the match, was quickly shared on social media, drawing a furious reaction. In response, Hibs revealed their intention to investigate. Meanwhile, after leading his side to a first win at Easter Road in four years, Hearts boss Craig Levein hit back at Hibs fans’ “class” taunts. Home supporters in the Famous Five Stand had needled their rivals with two huge pre-match banners that declared: “There’s class, there’s first class, and then there’s Hibs class,” referencing a quote by legendary manager Eddie Turnbull. Levein, in mischievous mood after his team’s 1-0 victory, didn’t let it slide. “I’m thrilled for the boys because they reached a new level today,” he said. “There’s class, there’s first class, there’s Hibs class, and then, one above that, there’s Hearts class. Hearts’ victory has left them poised just six points off the top of the Premiership. After a rough spell of results and a full-blown injury crisis, which now looks to be coming to an end, Levein is confident about his side’s chances after the winter break. He said: “I feel good about going into the second half of the season. They certainly competed with Hibs in front of a festive full house at Easter Road. And despite his unwillingness to miss a chance to wind Hibs up, Levein recognised how tight a contest it had been. “It was a normal derby match with all the things you’d expect in the melting pot,” he said. “I thought there was better football in this match than there was in the last one at Tynecastle. “I was quite happy with our control of the game in the first half, and in the second half. “But towards the end, when they threw Darren McGregor up and bombarded us with balls, we had to stand strong.